Licensed dealers can register with ADESA to access run lists, see condition reports, search inventory and buy online. Our units are fully self-contained. ADESA Mobile Auctions use state of the art mobile units. Each is equipped with all the tools of an auction block, including simulcasting all sales on ADESA LiveBlock. ADESA Mobile Auctions provide all the staff needed to hold an auction. We'll bring the Auctioneer, Ringman, Block Clerk, Drivers, Title Clerk and more, if needed. ADESA Mobile Auctions transport the sale to your location. Our mobile units travel to locations chosen by the seller, such as a dealership's back lot or an event venue. ADESA Mobile Auctions have all the manpower and technology you would find at a physical auction to facilitate a sale, including ADESA LiveBlock—a live streaming platform—to maximize exposure to interested buyers. It's an auction that’s personalized to the seller and their buyer base. Why choose a mobile auction? Mobile auctions provide buyers a more personalized approach to buying vehicles, because there's only one seller and one lane to monitor. The inventory is more focused to meet the buyers' needs. Sellers provide the inventory, and ADESA does the rest—from marketing to operations. Because there’s no competition, all eyes are on the seller’s inventory. Sellers can host the auctions almost anywhere, and all sales are simulcast via ADESA LiveBlock—to maximize exposure to interested buyers. Sellers avoid paying transportation expenses to ship cars to physical auction sites. Sellers also have flexibility to choose the venue, date and time. Who can participate in a mobile auction? Sales are available to all ADESA registered dealers, unless otherwise noted. How does a mobile auction work? Aside from providing the inventory, ADESA does everything—including bringing the auctioneer and ringman. ADESA checks in vehicles, facilitates the sale, collects payments, handles the titles and releases vehicles. ADESA can also provide pictures, condition reports and arbitration, on site. For information about how to host a mobile auction, please contact Andy Shaffer at mobile.auctions@adesa.com. Want to host a sale powered by ADESA Mobile Auctions? Great, here are a few things to consider. Do you have a location picked out? Think about where you’d like to host the mobile auction and how much space it'll need. The auction can be at your dealership or an off-site location of your choosing. When would you like to host the auction? Choose a time and date that will attract the largest number of buyers. If there are other auctions in the area, pick a date that doesn't compete with them. Make sure to give yourself enough time to plan the sale. How large is the inventory? 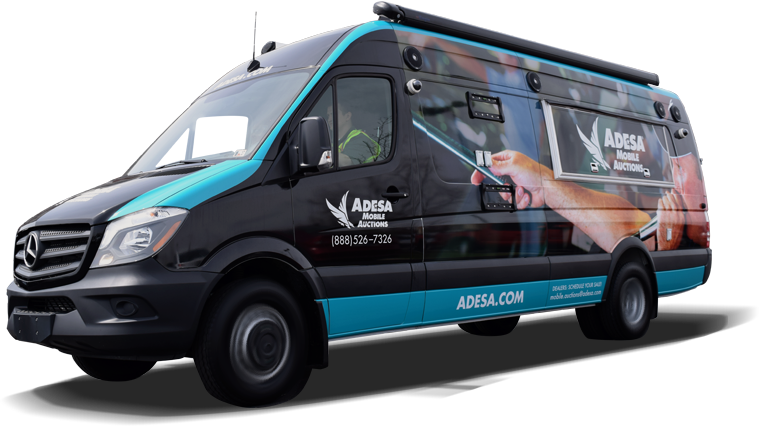 ADESA typically hosts mobile auctions for sales of 75 or more units. Contact us at mobile.auctions@adesa.com if you have additional questions or would like to learn more about hosting a mobile auction. We're happy to assist!